I have four glorious words for you: one-hundred percent edible. Yeah, I know we’ve already had a Geeky Cake of the Week (GCotWTM) this week. 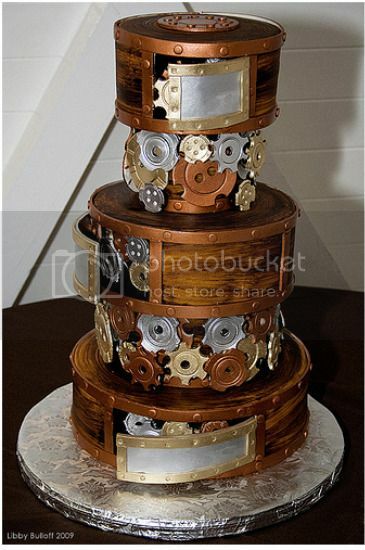 But I found this fantastic steampunk wedding cake from Mike’s Amazing Cakes on gearfuse and knew you’d want to see it immediately. Did I mention the complete edibleness? The fondant gears and other details frost layers of lemon cake. You can even see a photo of the steampunkish wedding couple themselves on Offbeat Bride. And yeah, they’re about what you’d expect. Preview: everyone’s wearing an old-timey mustache. Uh, doesn’t look very appetizing. Something about the idea of putting metal in my mouth? Ewww. Amazing work of art, unbelievable. thanks for the share. This guy is truly amazing. He was just on Food Network Cake Challenge and even blew away the great Collette Peters!